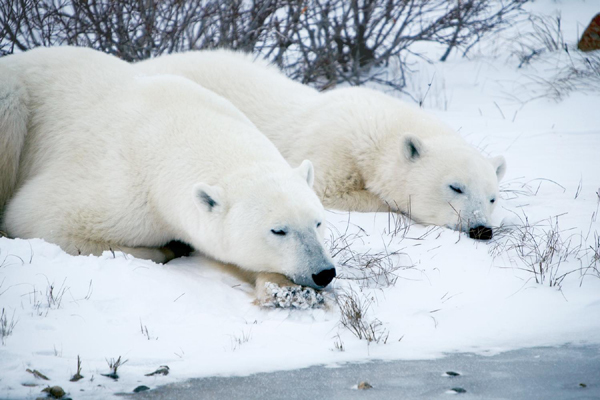 The polar bear (Ursus maritimus) is a bear native to the Arctic Ocean and its surrounding seas, and the largest carnivore found on land, with adult males weighing around 400�680 kilograms. It lives in a narrow ecological niche, with many body characteristics adapted for cold temperatures, for moving across snow, ice, and open water, and for hunting the seals which make up most of its diet. A major seaport and railroad stop on the shore of Hudson Bay, Churchill, Manitoba is a four season ecotourism destination, with attractions that include bird watching, beluga whale watching, white bear tours, northern lights, and other activities in its marine, tundra, and boreal forest ecosystems. SOURCE: Courtesy of Canadian Tourism Commission.